I want to know about Japanese dialects! There are tons of dialects in Japan - have you heard any of them? Sometimes it's hard even for Japanese people to understand regional dialects, as the language differs quite a bit between regions. Let's take a look at some websites that introduce dialects. If you're planning a trip to Japan at some point in the future it's definitely worth having a listen to different kinds of Japanese. 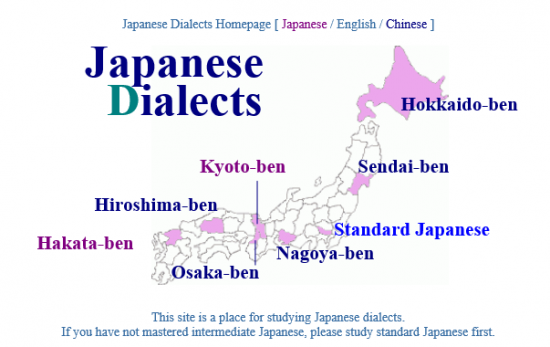 On this site you can find explanations of various grammar structures for the 7 regional dialects of Hokkaido, Sendai, Nagoya, Kyoto, Osaka, Hiroshima and Hakata (There are 8 in the Japanese version). You can watch videos for some of the dialects. Be warned that the dialect practice is pretty difficult, though! One of our team had trouble with the Kyoto-dialect questions, despite being born and raised there! Kansai is the region centred around the cities of Kyoto, Osaka, Kobe and so on. Here you can read detailed explanations of the grammar structures of Kansai-ben, hear stories about the Kansai-related experiences of foreigners who have come to the region and see videos of real Kansai dialect being spoken. Lee, an American who appears in the videos, speaks pretty good Kansai-ben. Here you can convert "standard Japanese" (標準語) into dialects such as Osaka-ben (大阪弁) or Kyoto-ben (京都弁). Sometimes the level of politeness may change too, so be careful! Why not see if there are some Japanese dialects that really grab you? It's fun to be able to understand the local dialect when you go on a trip, and if you can say a few phrases yourself you'll soon make friends! 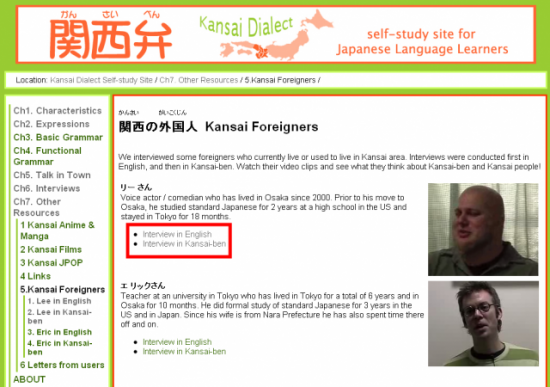 Re:I want to know about Japanese dialects!